When we finally got our official orders to leave Las Vegas and head back to the east coast, we immediately started our Vegas and the southwest family bucket list. Our Spring Break was to be an epic trek spanning Nevada, Arizona & Utah… until it wasn’t. Motherhood will continue to throw you curves and as sad as I was I had to roll with the punches. I picked my oldest son up from school mid-day on the Thursday before break with a high fever & chills. This weird virus presented no other symptoms with 6-8 hours of total normalcy followed by a high fever spike and sleep. Repeat x 3 days. We waited to see if we were going each day anticipating this trip only for a fever to hit again. 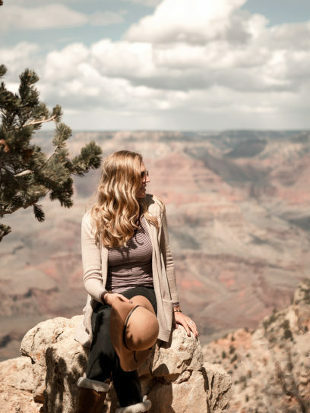 After nights at hotels passed their refund deadline and family spirits were waning, we decided to leave my oldest son behind with Gram and do a whirlwind trip with our youngest to salvage our epic Las Vegas to Grand Canyon road trip. Ah, motherhood. Forces you to make the big decisions whether you feel like adulting or not. My advice to enjoy your Spring Break is to have a plan but be okay with changing and morphing that plan into whatever works for the journey. Because as cliche as it sounds, life really is about the journey to the destination. 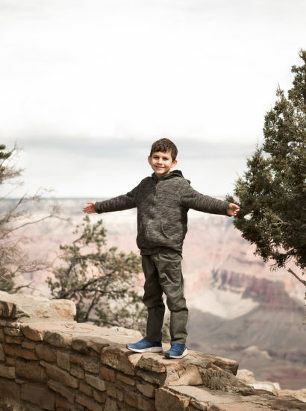 I asked my youngest son what his very favorite part was about the vacation and he said hiking down into the Grand Canyon (which hadn’t actually made the itinerary) and the amazing hotel in Page, AZ (just a simple Best Western but hotel rooms are my little guys castles). See ya’ll? Look at what means the most and will remain in your child’s memory forever. Getting up at 4:30am to leave Las Vegas we had to skip the lower Phoenix route and my dream of photographing those big ol’ amazing Saguaro cacti so we could B-line it directly to the South Rim of the Grand Canyon National Park. We took the busy shuttles all over the eastern area of the park enjoying all the vertigo-inducing, lack of proper-railinged overlooks and vistas into that vast divide. We deduced to hike down just a few switchbacks into the Grand Canyon via the South Kaibab trail when Gabe, my youngest son, wanted to go deeper and deeper. So down down down we went for a 2 hour long impromptu hike into the belly of the beast. When we finally arrive back at the top, big snowflakes began to drop on our heads. An hour later as we drive further through the park, all the vistas were a white-out due to this crazy Spring Break snowstorm?! Next stop- Page, Arizona. The highlights here (besides the hotel for Gabe lol) were definitely Antelope Canyon and Horseshoe Bend. Horseshoe Bend is a great place to see the mighty Colorado River hairpin bend around one large outcrop of rock and has quickly become an iconic vista for all Insatgrammers. Beware of the hundreds of other tourists infesting this area like little ants and hanging off the completely unprotected cliffs to get there perfect photos!? The view was worth it but we hightailed outta there pretty quickly because of the mayhem. Antelope Canyon was the absolute best part of the trip for both me and my husband. You have to book at least 2 weeks in advance to get a spot of the paid tour through this super narrow slot canyon by a Navajo guide because it is located on tribal land. Get the first tour before it’s over crowded with tourists and you can’t even stop for photos- that’s what we thankfully did. Words can’t describe the beauty so here are some pictures instead. Utah didn’t disappoint either! Winding through quaint abra kenabra (Kenab, UT) on our way into Zion National Park, we watched the landscape change into layered rolling orange and white sandstone mountains. Just before the park entrance, we stopped to watch a huge herd of buffalo migrating and grazing in the open fields. Here we stopped at whatever pull off had a space to park and just hiked around while Gabe scaled rocks and dug around in the red sand “beaches” as he called them. My husband and I just sat there in the serenity of wind whistling though the mountains watching our little guy play in the sand happy as a clam. These little moments are life. These little moments are what he will remember about his childhood living in Las Vegas and eclipse the hustle and bustle of perfectly pre-planned excursions. Sign up for LWH Monthly Newsletter here!